Super-heroes' days are action-packed. They race around the world, battle the baddest of bad guys, and outwit villains to keep people safe. They are also busy inventing gadgets and super hero suits and keeping the environment safe from harm, and some of them even have day jobs! But just like everyone else, after a long, hard day (of saving the world), Batman, Batgirl, Green Lantern, and The Flash head home to rest. 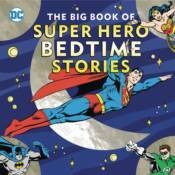 Superman, Supergirl, Hawkman, Cyborg, Raven, and the others get ready for bed and curl up to get a good night's sleep so they can be strong, smart, and powerful for another day.